Wow..You've shot it perfectly..This is how rush hour so busy..Great job! like this,., thanks man. was that tilt from the camera or edit by software? This superb work has been featured here: Miniature or Reality? 12 Examples of Tilt Shift Photography. A neat idea and a cool shot. What is the secret to make photos like this? 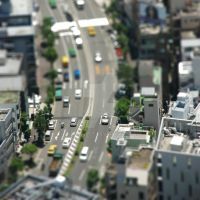 just google tilt shift - there u will find some tutorials how to create this effect in photoshop. Thank you much for your info!